This combination is so wonderful - both savoury and refreshing at the same time. Sure to become a regular feature of your summer dinning table. Peel and halve the red onion and cut into very fine slices and put in a small bowl to steep with the lime juice, this will bring out the translucent colour of the onions. Remove the rind and pips from the watermelon, and cut into approximately 1½ inch triangular chunks. Tear off sprigs of parsley so that it is used like a salad leaf, rather than a garnish, and add to the bowl along with the chopped mint. 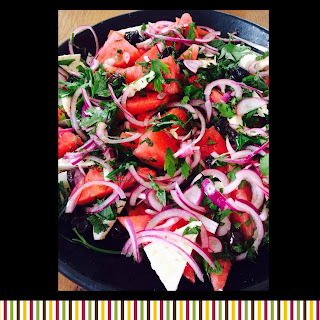 Tip the onions, along with their pink juices over the salad in the bowl, add the oil and olives, then toss the salad very gently so that the feta and melon don't lose their shape. Add a good grinding of black pepper to top off. Serve chilled.